The Aurora Chronograph heralds the global debut of a revolutionary innovative product: trigalight-hairlight is the most impressive light source ever created for watches. 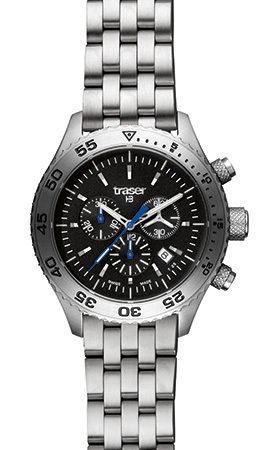 The Aurora Chronograph from Traser swiss H3 is named after a world-famous natural phenomenon: the aurora borealis or “Northern Lights.” The ultra-small glass capillaries in this chronograph’s dial glow in the amazing colors of the polar lights. Each capillary has an exterior diameter of 0.3 mm and a microscopically tiny interior diameter of just 0.15 mm, which is approximately equal to the diameter of a human hair. Such a miniscule diameter is globally unprecedented and unique in the watch industry. The timepiece convinces users with its robust design and boldly styled, 46-mm-diameter stainless steel case, which provides a perfect staging for the black dial with its unique trigalight self-activated illumination technology. When ambient lighting fades, trigalight reliably indicates the time with a remarkable light show. A precise Swiss chronograph movement ticks inside the case.